Mildew-resistant paints also contain special additives which help inhibit mold and mildew growth. Bathrooms require a special type of paint. Bathrooms that do not have a shower can be painted like any other room in your house. A latex-based paint should do a great job and provide excellent durability and coverage. Bathrooms with showers or bath tubs are a different story. The moisture in these bathrooms can cause a host of problems. Specially formulated bathroom paint will resolve these issues and provide excellent results. 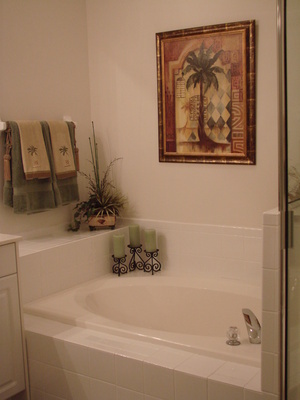 For a guest bath or powder room that does not have a shower or moisture issue, a latex-based paint will be sufficient. A latex-based paint in an eggshell or semi-gloss finish will provide some washability and durability. Latex-based paints are susceptible to water marks and leaching, so if moisture is an issue, you will not want to use this type of paint. They also provide no added mildew-resistant properties. Latex-based paints should only be used if moisture is not an issue in the particular room. Moisture can be a big problem in some bathrooms. If there is not proper ventilation in the bathroom, moisture, in the form of steam, can lead to drip marks on the walls. As the water and steam evaporate, some minerals in the water still remain on the walls. They usually appear as light brown-colored drip marks. These water marks are difficult to remove in a normal, latex-based paint. Also, the water leaches surfactants from the paint film. The surfactants are the colorants that paint companies use to tint the paint. This too can cause unsightly drip marks and inconsistent coloring on the walls. For a few extra dollars, a mildew-resistant paint would alleviate these problems. Special mildew-resistant paints do not rely on surfactants for their color. They rely on a special paint technology that uses waterborne colorants. These waterborne colorants will not cause drip marks on walls when moisture is present. Mildew-resistant paints are also extremely washable. Mineral deposits on the walls can easily be wiped away using water and a sponge. This is not the case with latex or oil-based paints. They are very durable and the paint will not peel or rub off after repeated cleaning. Mildew-resistant paints also contain special additives which help inhibit mold and mildew growth. Benjamin Moore's Aura line is a commonly used mildew-resistant paint. Other brands typically market the paint as "Bathroom Paint" or "Mildew-resistant Paint." This paint is applied the same way that a latex-based paint is applied. There is no need to prime the surface to be painted and even coverage is usually achieved in two to three coats, depending on color.